An old tarnished silver cream and sugar set began to shake on the antique walnut drop leaf table in the original north parlor. Home and Garden Tour on June 14th. Kitte is the daughter of the Kirk's who operated the Danish Smorgasboard from 1948-1972 at the manor. She raised her sons Tony, Mickey( Richfield's current Mayor Mike Lyons), and Teddy in what was once the carriage house of the Farnam Manor Estate. Beautiful original pieces of art by her mother Marie Kirk were lent by the Richfield Historical Society for display on the tour. Olivia, her daughter in law, made beautiful music flow from the late 1800 pipe organ donated by the Sheryaks of Brush Road. It was the first music coming from that organ in years! Also featured in the tour was Jeff Lamphere, a decendant of Sarah Lamphere, the tutor of the Farnam children. He shared vivid stories of the Farnams that Sarah had written in her diary. 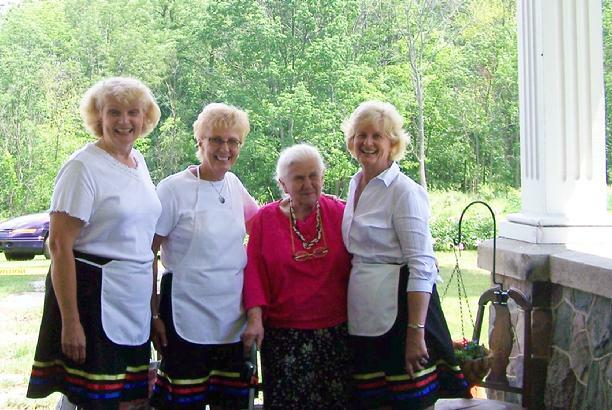 Dressed in their waitress costumes, the 3 Luther sisters brought back memories of the Danish Smorgasboard. This was the only place to find work for miles around back then . They worked for 80 cents / hour! A surprise visit from Harry Zaruba and Christine completed the reunion. Zaruba saved the manor from being condemned with major renovation. We offer our heartfelt appreciation to Richfield Town Trust and the many volunteers for making the tour possible! Thanks to the Richfield Historical Society for the donation of plants for the Farnam Friendship Garden! The many beautiful perennials will come back year after year to commemorate this special day!